Seattle built the fourth-most apartments of any metro area in the country over the past year, with only New York, Los Angeles and Dallas — all with far bigger populations than Seattle — building more. Take a community-by-community look at what it costs to rent, and how that's changing in the Puget Sound area. Seattle is building more apartments than just about anywhere, and now 1 in 10 units across the city are sitting empty. Landlords have responded by lowering rents slightly and offering more perks to get tenants in the door. The housing market is almost always at its slowest this time of year, but the changes this winter have been especially stark, according to new figures from Apartment Insights/RealData, which surveys landlords here quarterly. Across King and Snohomish counties, apartment rents dropped 1.1 percent from the third to fourth quarter, the second-biggest quarterly drop this decade, behind only the 2.9 percent drop seen at this time last year. When factoring in concessions landlords are offering to lure tenants, like a free month’s rent, the actual amount renters paid dropped 1.4 percent in the past quarter, or $24 a month. Those incentives are now commonplace at new buildings and becoming more prominent in older complexes that are also struggling to fill up their units. Some property managers are even offering mystery gifts to those who agree to just show up for a tour. The market is cooling the most in the priciest parts of the region. On the Eastside, rents dipped 2.5 percent, or nearly $50, in the last quarter, while rents remained virtually unchanged in South King County and Snohomish County. Rents dropped at least 3 percent in the past quarter in Belltown, South Lake Union, Fremont/Wallingford, Kirkland, Redmond, Sammamish/Issaquah and Edmonds. 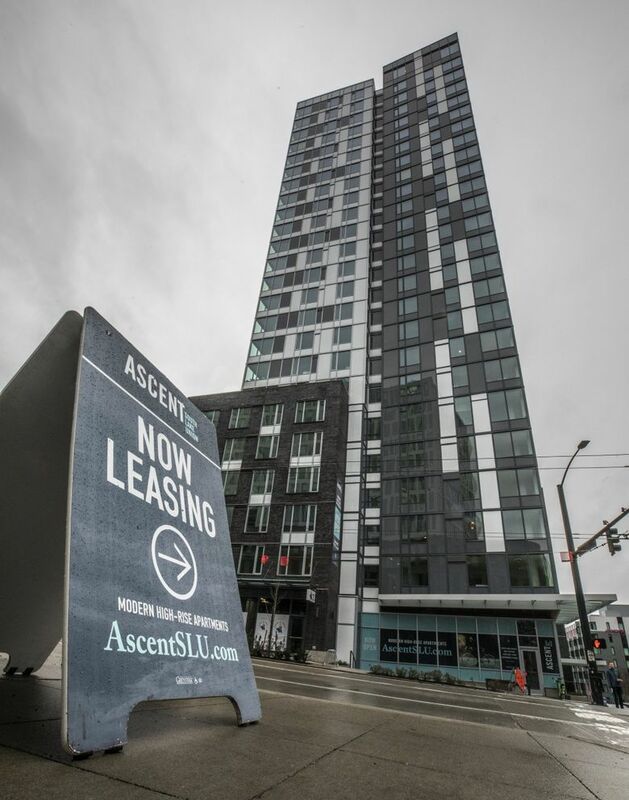 Seattle rents are dropping at the fourth-fastest rate in the country, behind Cleveland, Oakland and Spokane, according to apartmentlist.com. A year and a half ago it was common to find Seattle on the list of fastest-rising rents in the nation. Year-over-year, rents were still up about 3 percent in Seattle and the Eastside after adjusting for landlord concessions, just a bit more than inflation. The trend is likely to continue: The apartment-construction surge that began earlier this decade is continuing at the same brisk pace, outpacing demand for rentals even as the city’s population booms. When looking at all apartments available for rent in the city of Seattle — including new ones — 10.5 percent are empty, up from 9 percent a year ago and 7.7 percent two years ago. But that’s happening not just in Seattle: Across the region, 8.6 percent of units are empty, the most since 2009. In South Lake Union, where Amazon has spawned a new neighborhood with burgeoning apartment high-rises, 18 percent of units are empty. Vacancies hit 16 percent in the downtown Seattle core, 13 percent in First Hill, 11 percent in Queen Anne/Magnolia and 12 percent in Redmond, which is building the most apartments among King County suburbs. About 15 percent of units are empty in both Tukwila and Sammamish/Issaquah, which each just opened large new apartment buildings. Those numbers are skewed by the new buildings still leasing up, but even landlords with older apartments are having more trouble finding renters. The regional vacancy rate among “stabilized” buildings that have been around at least a couple years was 5.5 percent, the highest since 2010 and up from a low of 3.9 percent a few years ago. Developers don’t appear to be souring on the Seattle area, even a full year into the rental-market cool-down. A total of 24,000 units are under construction or scheduled to begin soon, a figure that hasn’t budged in the past year. The pipeline for future potential projects is at 34,000 units, also essentially unchanged from a year ago, although those projects may not necessarily get built. The Seattle metro area, which is the 15th largest in the country by population, had the fourth-most multifamily units approved for construction in 2018, according to Census figures. Only the New York, Los Angeles and Dallas areas gave out permits for more. The Seattle area approved permits for twice as many units as the Chicago or Boston regions, which are both larger. It greenlit 25 percent more than the San Francisco region, which is bigger and has double Seattle’s housing costs. While it was nothing but good news for renters in 2018, the region, of course, still remains unaffordable for many after rents soared about 60 percent from 2010 to 2017. Average asking rents across all unit types are now $1,924 in Seattle and $1,954 on the Eastside. Rents are at $1,502 in Snohomish County and $1,448 in South King County. Regionwide, even with the recent decrease, the average rent has soared from $1,034 in 2010 to $1,725 now. The extra $691 a month in rent amounts to about $8,300 in extra costs over the course of a year compared with the start of the decade. But renters who shop around can take advantage of the new-supply glut to get some deals. Carl Hiltbrunner recently faced a 3 percent rent increase at his place downtown and decided to move. He toured five apartments and found one that provided his first six weeks rent-free.